Romeo and Juliet get transposed to US gang life. Much can be said about this as a film, but the real merit goes definitely to the original musical, Bernstein's music and Sondheim's lyrics just make this an amazing musical which would then lead to a great film without needing to add much to it. However it also shows us that musical theatre was far ahead of the cinema in what came to social politics, and it is weird to find that one of the most politically and socially hard-hitting films of the early 60s is indeed an adaptation of a musical. Problems of racism, immigration, social inclusion, police brutality and institutionalised racism are explored at a deeper level here than you would expect. The casting is sometimes pretty bad, the two main characters are unconvincing, but it is filled with some great minor characters with Rita Moreno pretty much stealing the show throughout. And it is really when it comes to the musical numbers that the film becomes the most affecting and fun. Great Stuff. Elvis Presley was originally approached for Tony. However, his manager, Colonel Parker, strongly believed the role to be wrong for Elvis and made him decline in favor of other movie musicals. When the movie became a hit and earned 10 Oscars, Elvis later regretted having given up the part. He was only one of many young stars that were in consideration for the role of Tony. 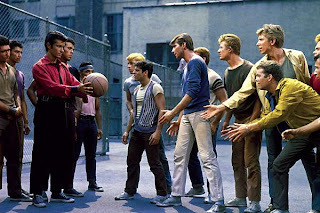 Several Hollywood men auditioned for the part, including Warren Beatty, Tab Hunter, Anthony Perkins, Russ Tamblyn, Burt Reynolds, Troy Donahue, Bobby Darin, Richard Chamberlain, and Gary Lockwood.